The Fellowship was fortunate enough to obtain a copy of MUNCHKIN #1 from BOOM! Studios (under the BOOM! Box imprint). Tom Siddell, Jim Zub and John Kovalic write, with art by Mike Holmes, Fred Stresing, Rian Sygh and Kovalic. This book contains a set of stories which try to embrace the essence of the immensely popular game Munchkin (by Steve Jackson Games). In the first, we are given a description of what the game is about (from a certain point of view). The next story gives us a very different perspective, perhaps a more practical one. In the third we meet Spyke, an iconic character from the game, who epitomizes the spirit of Munchkin. And Kovalic’s endcap lets us glimpse into the humor of the game in his own special way. As an old RPG player, I think Munchkin (the game) is pretty cool. It’s borderline parody, really, a dramatic oversimplification of the classic “dungeon crawl.” This book, though, does a really nice job of showing some of the humorous possibilities in the game. Both the writing and the art are top-notch. Most gamers will get a kick out of this book, but it’s pretty funny gamer or no. Munchkin fans will surely like it. So pick up and see if you’re one of them. 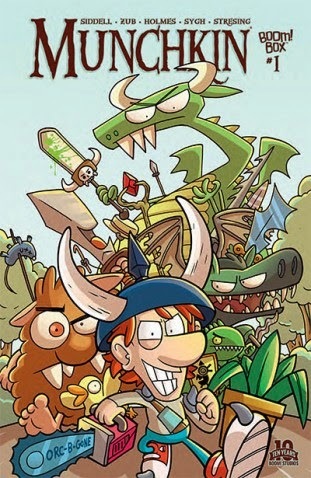 MUNCHKIN #1 is available now at your FLCS or at boom-studios.com.